Figure 1. Circos plots of somatic point mutations and copy number mutations identified in cutaneous T cell. lymphoma. 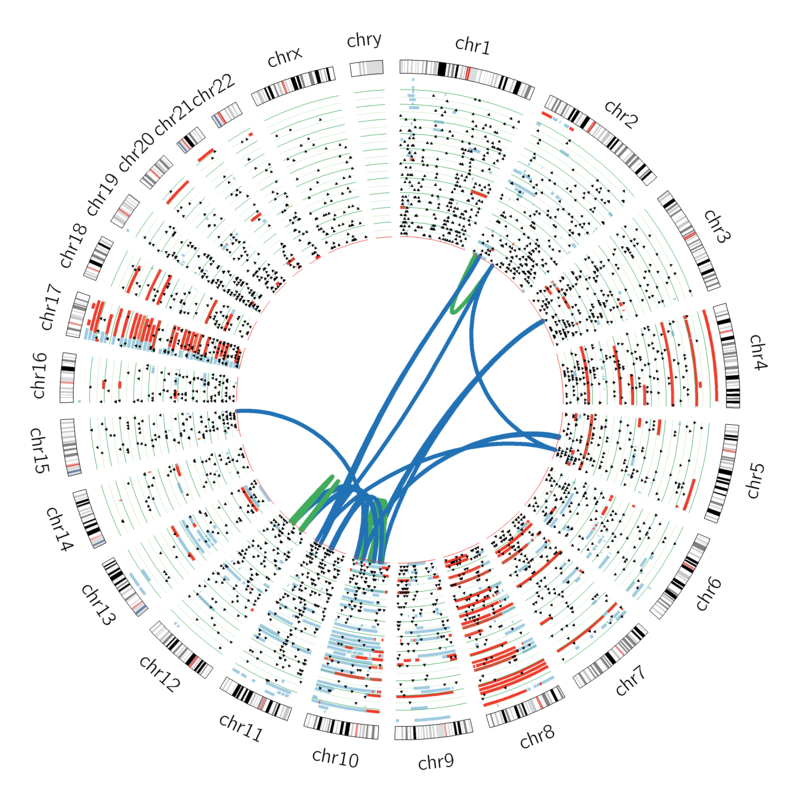 Point mutations are indicated by black triangles; deletions, light blue boxes; amplifications, red boxes; translocations, royal blue lines; intrachromosomal rearrangements, green lines. We employ cutting-edge genomics approaches to identify the genetic basis of skin cancers and inherited and acquired immunological disorders. Learn more about recent publications from the lab. Gene Discovery: We are using cutting edge next generation sequencing to identify the genetic basis of other inherited and acquired skin diseases and cancers. Molecular Mechanisms: We are using human and animal models to determine how mutations we have discovered affect disease pathogenesis. Clinical Translation: We are actively studying methods to translate our findings into clinically useful biomarkers and novel therapeutics.